It appears the Army Corps of Engineers has concerns about the early plans it's seen. There is concern that the Harold Simmons Park will need to be re-thought. 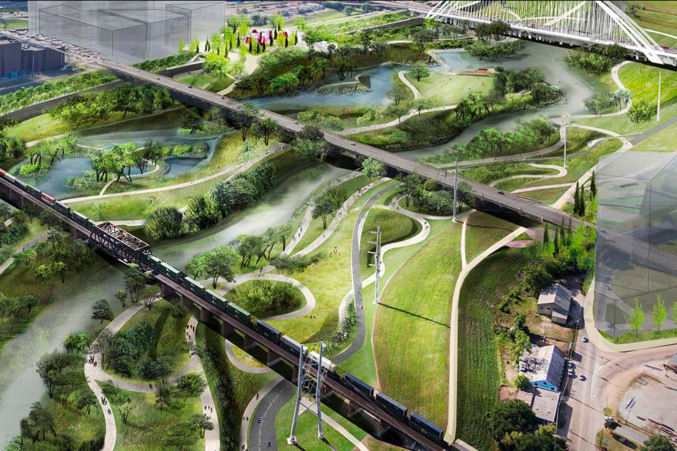 At least two members of the public entity (known as a “local government corporation” or LGC) that is overseeing the development of the park within the Trinity River levees have questioned whether the Army Corps of Engineers will approve the current design. Because the proposed park site sits within a floodway, federal law dictates that whatever is built there adhere to a comprehensive design schematic known as the Balanced Vision Plan. The Corps approved it in 2015; it is supposed to be the backbone of the design for anything that gets built in the 2,300-acre floodway. The Balanced Vision Plan makes it clear that recreational components cannot interfere with the movement of water through the area. The project in question is Harold Simmons Park, a 200-acre carve-out, a privately funded $150 million park that will sit between the Ronald Kirk Pedestrian Bridge and Interstate 30. 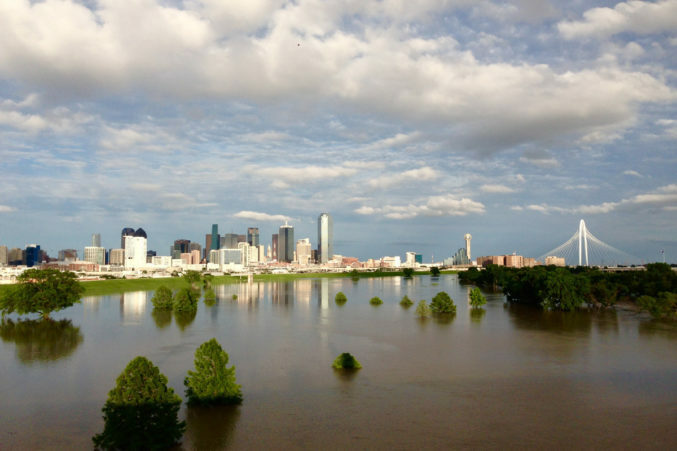 On March 22 at City Hall, there was a regular meeting of the Trinity River’s LGC, the public body that acts like the board of directors for what goes on in the floodway. Its role is to make sure a park gets paid for and built. A few members of the LGC opened the meeting with concerns about feedback that the Corps had recently provided to the city, the Conservancy, and its partners regarding the presentation of a design plan that is about 10 percent completed. One of the options was to scrap the plan and start from scratch, according to two people who were present. Quicksall said there were three options discussed at that meeting. One was to scrap the Balanced Vision Plan and start the entire process over again, which everyone in the room agreed was not realistic. The second was to find a middle ground, “to try to amend what was in the original design to make it fit what’s already been approved.” The third was to start the design again from scratch, building it from the ground up. The Conservancy, despite reiterating that the design is not finalized, has made detailed presentations to the public. One late last year involved a 60-foot print on white fabric that chopped up the 200 acres into cross sections. That detailed all sorts of things: manmade channels, managed grasslands, wetlands, paths, gathering places atop the levees, access points, pedestrian bridges, and urban-style parks above the floodway. Limnotech said it used data to better understand regular flooding, erosion, and the impact of adding additional trees, wetlands, river channels, bridges, and other changes. There were lectures about the history of the river, how much water it can hold, and its ecology and hydrology. It wasn’t a formal plan, but it certainly looked like one if you didn’t know better. The concern now is whether that spirit is misplaced. There is a push to simply “re-wild” the floodway, incorporating elements that will embrace the native flora and fauna that will thrive there, returning the area to a state more resembling a natural blackland prairie. Or as close to it as possible. And, indeed, a plan had emerged to do just that at a neighboring patch of land. When the Conservancy and the city met with the Corps, Quicksall said the presentation was similar to what the public saw at Gilley’s. At one point, Owen questioned the park’s hydrology and said the Corps “wouldn’t accept a 200-acre carveout” of the 2,300-acre floodway because of how it may affect water flow in other parts of the floodway. Brown said they’re “right on track with that” and that the models being produced are within what’s required by the Balanced Vision Plan and plan for how Harold Simmons will affect the rest of the floodplain. Longtime Trinity park skeptics called for blood. Angela Hunt, the former councilwoman who led the fight against the Trinity toll road and has called for that simpler re-wilding of the floodway, posted the meeting to Facebook over the weekend. She called for the city to terminate the contract with the LGC and sever the relationship with the Conservancy. Councilman Scott Griggs, a mayoral candidate, echoed Hunt’s sentiment. Brown, in the later interview, maintained that the Conservancy is on schedule to submit a formal review to the Corps in August. At 35 percent, that plan will include more technical detail regarding hydrology and hydraulic modeling. He isn’t asking for a delay. He says the meeting with the Corps was a “coordination meeting,” one requested by the city to receive feedback on the current progress. He says nothing technical was discussed and the Conservancy is continuing its outreach and funding efforts as Van Valkenburgh and Limnotech move forward with design.